By the early 1930s, the talkies were a global phenomenon. 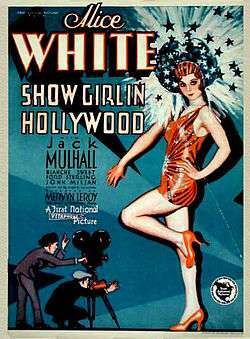 In the United States, they helped secure Hollywood's position as one of the world's most powerful cultural/commercial centers of influence (see Cinema of the United States). In Europe (and, to a lesser degree, elsewhere), the new development was treated with suspicion by many filmmakers and critics, who worried that a focus on dialogue would subvert the unique aesthetic virtues of soundless cinema. In Japan, where the popular film tradition integrated silent movie and live vocal performance, talking pictures were slow to take root. In India, sound was the transformative element that led to the rapid expansion of the nation's film industry. For more details on this topic, see Kinetoscope. Though sound-on-film would eventually become the universal standard for synchronized sound cinema, Lauste never successfully exploited his innovations, which came to an effective dead end. In 1914, Finnish inventor Eric Tigerstedt was granted German patent 309,536 for his sound-on-film work; that same year, he apparently demonstrated a film made with the process to an audience of scientists in Berlin. Hungarian engineer Denes Mihaly submitted his sound-on-film Projectofon concept to the Royal Hungarian Patent Court in 1918; the patent award was published four years later. Whether sound was captured on cylinder, disc, or film, none of the available technology was adequate for big-league commercial purposes, and for many years the heads of the major Hollywood film studios saw little benefit in producing sound motion pictures. On April 15, 1923, at New York City's Rivoli Theater, came the first commercial screening of motion pictures with sound-on-film, the future standard: a set of shorts under the banner of De Forest Phonofilms, accompanying a silent feature. That June, De Forest entered into an extended legal battle with an employee, Freeman Harrison Owens, for title to one of the crucial Phonofilm patents. Although De Forest ultimately won the case in the courts, Owens is today recognized as a central innovator in the field. The following year, De Forest's studio released the first commercial dramatic film shot as a talking picture—the two-reeler Love's Old Sweet Song, directed by J. Searle Dawley and featuring Una Merkel. However, phonofilm's stock in trade was not original dramas but celebrity documentaries, popular music acts, and comedy performances. President Calvin Coolidge, opera singer Abbie Mitchell, and vaudeville stars such as Phil Baker, Ben Bernie, Eddie Cantor and Oscar Levant appeared in the firm's pictures. Hollywood remained suspicious, even fearful, of the new technology. As Photoplay editor James Quirk put it in March 1924, "Talking pictures are perfected, says Dr. Lee De Forest. So is castor oil." 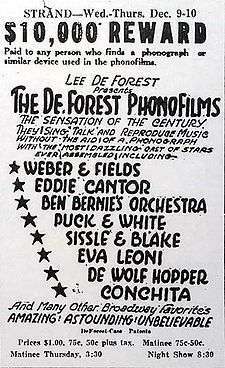 De Forest's process continued to be used through 1927 in the United States for dozens of short Phonofilms; in the UK it was employed a few years longer for both shorts and features by British Sound Film Productions, a subsidiary of British Talking Pictures, which purchased the primary Phonofilm assets. By the end of 1930, the Phonofilm business would be liquidated. 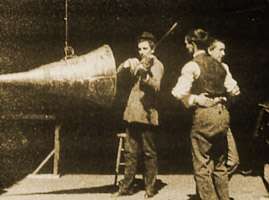 In Europe, others were also working on the development of sound-on-film. In 1919, the same year that DeForest received his first patents in the field, three German inventors Josef Engl (1893–1942), Hans Vogt (1890–1979), and Joseph Massolle (1889–1957) patented the Tri-Ergon sound system. On September 17, 1922, the Tri-Ergon group gave a public screening of sound-on-film productions—including a dramatic talkie, Der Brandstifter (The Arsonist) —before an invited audience at the Alhambra Kino in Berlin. By the end of the decade, Tri-Ergon would be the dominant European sound system. 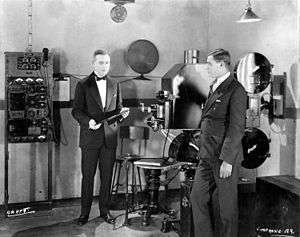 In 1923, two Danish engineers, Axel Petersen and Arnold Poulsen, patented a system that recorded sound on a separate filmstrip running parallel with the image reel. Gaumont licensed the technology and briefly put it to commercial use under the name Cinéphone. In 1925, Sam Warner of Warner Bros., then a small Hollywood studio with big ambitions, saw a demonstration of the Western Electric sound-on-disc system and was sufficiently impressed to persuade his brothers to agree to experiment with using this system at New York's Vitagraph Studios, which they had recently purchased. The tests were convincing to the Warner Brothers, if not to the executives of some other picture companies who witnessed them. Consequently, in April 1926 the Western Electric Company entered into a contract with Warner Brothers and W. J. Rich, a financier, giving them an exclusive license for recording and reproducing sound pictures under the Western Electric system. To exploit this license the Vitaphone Corporation was organized with Samuel L. Warner as its president. Vitaphone, as this system was now called, was publicly introduced on August 6, 1926, with the premiere of the nearly three-hour-long Don Juan; the first feature-length movie to employ a synchronized sound system of any type throughout, its soundtrack contained a musical score and added sound effects, but no recorded dialogue—in other words, it had been staged and shot as a silent film. Accompanying Don Juan, however, were eight shorts of musical performances, mostly classical, as well as a four-minute filmed introduction by Will H. Hays, president of the Motion Picture Association of America, all with live-recorded sound. These were the first true sound films exhibited by a Hollywood studio. Warner Bros.' The Better 'Ole, technically similar to Don Juan, followed in October. The engineers working on the sound-on-disc system were able to draw on expertise that Western Electric already had in electrical disc recording and were thus able to make faster initial progress. The main change required was to increase the playing time of the disc so that it could match that of a standard 1,000 ft (300 m) reel of 35 mm film. The chosen design used a disc measuring 16 inches (410 mm) rotating at 33 1/3 rpm. This could play for 11 minutes, the running time of 1000 ft of film at 90 ft/min (24 frames/s). Because of the larger diameter the minimum groove velocity of 70 ft/min (14 inches or 356 mm/s) was only slightly less than that of a standard 10-inch 78 rpm commercial disc. In 1925, the company publicly introduced a greatly improved system of electronic audio, including sensitive condenser microphones and rubber-line recorders (named after the use of a rubber damping band for recording with better frequency response onto a wax master disk). That May, the company licensed entrepreneur Walter J. Rich to exploit the system for commercial motion pictures; he founded Vitagraph, in which Warner Bros. acquired a half interest, just one month later. In April 1926, Warners signed a contract with AT&T for exclusive use of its film sound technology for the redubbed Vitaphone operation, leading to the production of Don Juan and its accompanying shorts over the following months. During the period when Vitaphone had exclusive access to the patents, the fidelity of recordings made for Warners films was markedly superior to those made for the company's sound-on-film competitors. Meanwhile, Bell Labs—the new name for the AT&T research operation—was working at a furious pace on sophisticated sound amplification technology that would allow recordings to be played back over loudspeakers at theater-filling volume. The new moving-coil speaker system was installed in New York's Warners Theatre at the end of July and its patent submission, for what Western Electric called the No. 555 Receiver, was filed on August 4, just two days before the premiere of Don Juan. In February 1927, an agreement was signed by five leading Hollywood movie companies: Famous Players Lasky (soon to be part of Paramount), Metro-Goldwyn-Mayer, Universal, First National, and Cecil B. DeMille's small but prestigious Producers Distributing Corporation (PDC). The five studios agreed to collectively select just one provider for sound conversion. The alliance then sat back and waited to see what sort of results the forerunners came up with. In May, Warner Bros. sold back its exclusivity rights to ERPI (along with the Fox-Case sublicense) and signed a new royalty contract similar to Fox's for use of Western Electric technology. As Fox and Warners pressed forward with sound cinema in different directions, both technologically and commercially—Fox with newsreels and then scored dramas, Warners with talking features—so did ERPI, which sought to corner the market by signing up the five allied studios. Then, on October 6, 1927, Warner Bros.' The Jazz Singer premiered. It was a smash box office success for the mid-level studio, earning a total of $2.625 million in the United States and abroad, almost a million dollars more than the previous record for a Warners film. Produced with the Vitaphone system, most of the film does not contain live-recorded audio, relying, like Sunrise and Don Juan, on a score and effects. When the movie's star, Al Jolson, sings, however, the film shifts to sound recorded on the set, including both his musical performances and two scenes with ad-libbed speech—one of Jolson's character, Jakie Rabinowitz (Jack Robin), addressing a cabaret audience; the other an exchange between him and his mother. The "natural" sounds of the settings were also audible. Though the success of The Jazz Singer was due largely to Jolson, already established as one of America's biggest music stars, and its limited use of synchronized sound hardly qualified it as an innovative sound film (let alone the "first"), the movie's profits were proof enough to the industry that the technology was worth investing in. The development of commercial sound cinema had proceeded in fits and starts before The Jazz Singer, and the film's success did not change things overnight. Not until May 1928 did the group of four big studios (PDC had dropped out of the alliance), along with United Artists and others, sign with ERPI for conversion of production facilities and theaters for sound film. Initially, all ERPI-wired theaters were made Vitaphone-compatible; most were equipped to project Movietone reels as well. However, even with access to both technologies, most of the Hollywood companies remained slow to produce talking features of their own. No studio besides Warner Bros. released even a part-talking feature until the low-budget-oriented Film Booking Offices of America (FBO) premiered The Perfect Crime on June 17, 1928, eight months after The Jazz Singer. FBO had come under the effective control of a Western Electric competitor, General Electric's RCA division, which was looking to market its new sound-on-film system, Photophone. Unlike Fox-Case's Movietone and De Forest's Phonofilm, which were variable-density systems, Photophone was a variable-area system—a refinement in the way the audio signal was inscribed on film that would ultimately become the standard. (In both sorts of systems, a specially-designed lamp, whose exposure to the film is determined by the audio input, is used to record sound photographically as a series of minuscule lines. In a variable-density process, the lines are of varying darkness; in a variable-area process, the lines are of varying width.) By October, the FBO-RCA alliance would lead to the creation of Hollywood's newest major studio, RKO Pictures. Yet most American movie theaters, especially outside of urban areas, were still not equipped for sound: while the number of sound cinemas grew from 100 to 800 between 1928 and 1929, they were still vastly outnumbered by silent theaters, which had actually grown in number as well, from 22,204 to 22,544. The studios, in parallel, were still not entirely convinced of the talkies' universal appeal—through mid-1930, the majority of Hollywood movies were produced in dual versions, silent as well as talking. Though few in the industry predicted it, silent film as a viable commercial medium in the United States would soon be little more than a memory. Points West, a Hoot Gibson Western released by Universal Pictures in August 1929, was the last purely silent mainstream feature put out by a major Hollywood studio. On August 23, the modest-sized Austrian film industry came out with a talkie: G’schichten aus der Steiermark (Stories from Styria), an Eagle Film–Ottoton Film production. On September 30, the first entirely German-made feature-length dramatic talkie, Das Land ohne Frauen (Land Without Women), premiered. A Tobis Filmkunst production, about one-quarter of the movie contained dialogue, which was strictly segregated from the special effects and music. The response was underwhelming. Sweden's first talkie, Konstgjorda Svensson (Artificial Svensson), premiered on October 14. Eight days later, Aubert Franco-Film came out with Le Collier de la reine (The Queen's Necklace), shot at the Épinay studio near Paris. Conceived as a silent film, it was given a Tobis-recorded score and a single talking sequence—the first dialogue scene in a French feature. On October 31, Les Trois masques debuted; a Pathé-Natan film, it is generally regarded as the initial French feature talkie, though it was shot, like Blackmail, at the Elstree studio, just outside London. The production company had contracted with RCA Photophone and Britain then had the nearest facility with the system. The Braunberger-Richebé talkie La Route est belle, also shot at Elstree, followed a few weeks later. 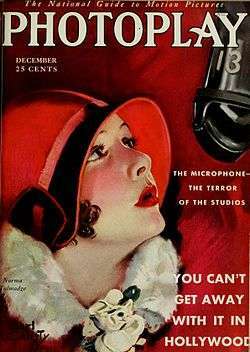 Similarly, Clara Bow's speaking voice was sometimes blamed for the demise of her Hollywood career, though the real issues involved her clashes with studio executives and what film historian David Thomson describes as the "backlash of bourgeois hypocrisy" against a lifestyle that would have been unremarkable for a male star. Buster Keaton was eager to explore the new medium, but when his studio, MGM, made the changeover to sound, he was quickly stripped of creative control. Though a number of Keaton's early talkies made impressive profits, they were artistically dismal. 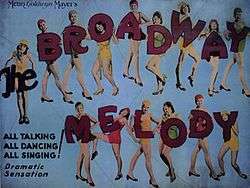 Several of the new medium's biggest attractions came from vaudeville and the musical theater, where performers such as Jolson, Eddie Cantor, Jeanette MacDonald, and the Marx Brothers were accustomed to the demands of both dialogue and song. James Cagney and Joan Blondell, who had teamed on Broadway, were brought west together by Warner Bros. in 1930. A few actors were major stars during both the silent and the sound eras: Richard Barthelmess, Clive Brook, Bebe Daniels, Norma Shearer, the comedy team of Stan Laurel and Oliver Hardy, and the incomparable Charlie Chaplin, whose City Lights (1931) and Modern Times (1936) employed sound almost exclusively for music and effects. Janet Gaynor became a top star with the synch-sound but dialogueless Seventh Heaven and Sunrise, as did Joan Crawford with the technologically similar Our Dancing Daughters (1928). Greta Garbo was the one non–native English speaker to retain Hollywood stardom on both sides of the great sound divide. The new emphasis on speech also caused producers to hire many novelists, journalists, and playwrights with experience writing good dialogue. Among those who became Hollywood scriptwriters during the 1930s were Nathanael West, William Faulkner, Robert Sherwood, Aldous Huxley, and Dorothy Parker. This is the case of Art vs. Mechanical Music in theatres. The defendant stands accused in front of the American people of attempted corruption of musical appreciation and discouragement of musical education. Theatres in many cities are offering synchronised mechanical music as a substitute for Real Music. If the theatre-going public accepts this vitiation of its entertainment program a deplorable decline in the Art of Music is inevitable. Musical authorities know that the soul of the Art is lost in mechanisation. It cannot be otherwise because the quality of music is dependent on the mood of the artist, upon the human contact, without which the essence of intellectual stimulation and emotional rapture is lost. In September 1926, Jack L. Warner, head of Warner Bros., was quoted to the effect that talking pictures would never be viable: "They fail to take into account the international language of the silent pictures, and the unconscious share of each onlooker in creating the play, the action, the plot, and the imagined dialogue for himself." Much to his company's benefit, he would be proven very wrong—between the 1927–28 and 1928–29 fiscal years, Warners' profits surged from $2 million to $14 million. Sound film, in fact, was a clear boon to all the major players in the industry. During that same twelve-month span, Paramount's profits rose by $7 million, Fox's by $3.5 million, and Loew's/MGM's by $3 million. RKO, which hadn't even existed in September 1928 and whose parent production company, FBO, was in the Hollywood minor leagues, by the end of 1929 was established as one of America's leading entertainment businesses. Fueling the boom was the emergence of an important new cinematic genre made possible by sound: the musical. Over sixty Hollywood musicals were released in 1929, and more than eighty the following year. ↑ Wierzbicki (2009), p. 74; "Representative Kinematograph Shows" (1907).The Auxetophone and Other Compressed-Air Gramophones explains pneumatic amplification and includes several detailed photographs of Gaumont's Elgéphone, which was apparently a slightly later and more elaborate version of the Chronomégaphone. ↑ Robertson (2001) claims that German inventor and filmmaker Oskar Messter began projecting sound motion pictures at 21 Unter den Linden in September 1896 (p. 168), but this seems to be an error. Koerber (1996) notes that after Messter acquired the Cinema Unter den Linden (located in the back room of a restaurant), it reopened under his management on September 21, 1896 (p. 53), but no source beside Robertson describes Messter as screening sound films before 1903. ↑ Lloyd and Robinson (1986), p. 91; Barnier (2002), pp. 25, 29; Robertson (2001), p. 168. Gratioulet went by his given name, Clément-Maurice, and is referred to thus in many sources, including Robertson and Barnier. Robertson incorrectly states that the Phono-Cinéma-Théâtre was a presentation of the Gaumont Co.; in fact, it was presented under the aegis of Paul Decauville (Barnier, ibid.). ↑ Crafton (1997), p. 37. ↑ Barnier (2002), p. 29. ↑ Altman (2005), p. 158. If there was a drawback to the Elgéphone, it was apparently not a lack of volume. Dan Gilmore describes its predecessor technology in his 2004 essay "What's Louder than Loud? The Auxetophone": "Was the Auxetophone loud? It was painfully loud." 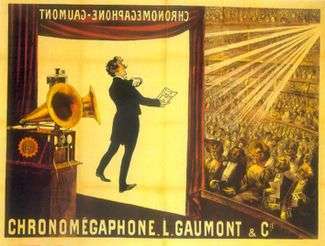 For a more detailed report of Auxetophone-induced discomfort, see The Auxetophone and Other Compressed-Air Gramophones. 1 2 Altman (2005), pp. 158–65; Altman (1995). ↑ Gomery (1985), pp. 54–55. ↑ Lindvall (2007), pp. 118–25; Carey (1999), pp. 322–23. ↑ Eyman (1997), pp. 30–31. ↑ Sipilä, Kari (April 2004). "A Country That Innovates". Ministry for Foreign Affairs of Finland. Retrieved December 8, 2009. "Eric Tigerstedt". Film Sound Sweden. Retrieved December 8, 2009. See also A. M. Pertti Kuusela, E.M.C Tigerstedt "Suomen Edison" (Insinööritieto Oy: 1981). ↑ Bognár (2000), p. 197. ↑ Gomery (1985), pp. 55–56. ↑ Crafton (1997), pp. 51–52; Moone (2004); Łotysz (2006). Note that Crafton and Łotysz describe the demonstration as taking place at an AIEE conference. Moone, writing for the journal of the University of Illinois at Urbana-Champaign's Electrical and Computer Engineering Department, says the audience was "members of the Urbana chapter of the American Institute of Electrical Engineers." ↑ Gomery (2005), p. 30; Eyman (1997), p. 49. ↑ Hall, Brenda J. (July 28, 2008). "Freeman Harrison Owens (1890–1979)". Encyclopedia of Arkansas History and Culture. Retrieved December 7, 2009. ↑ A few sources indicate that the film was released in 1923, but the two most recent authoritative histories that discuss the film—Crafton (1997), p. 66; Hijiya (1992), p. 103—both give 1924. There are claims that De Forest recorded a synchronized musical score for director Fritz Lang's Siegfried (1924) when it arrived in the United States the year after its German debut—Geduld (1975), p. 100; Crafton (1997), pp. 66, 564—which would make it the first feature film with synchronized sound throughout. There is no consensus, however, concerning when this recording took place or if the film was ever actually presented with synch-sound. For a possible occasion for such a recording, see the August 24, 1925, New York Times review of Siegfried, following its American premiere at New York City's Century Theater the night before, which describes the score's performance by a live orchestra. ↑ Robertson (2001), p. 168. ↑ Crisp (1997), pp. 97–98; Crafton (1997), pp. 419–20. ↑ See Freeman Harrison Owens (1890–1979), op. cit. 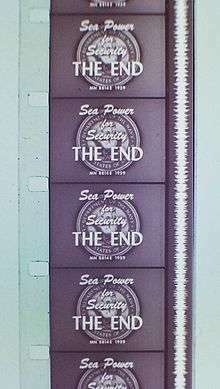 A number of sources erroneously state that Owens's and/or the Tri-Ergon patents were essential to the creation of the Fox-Case Movietone system. 1 2 Crafton (1997), pp. 71–72. ↑ The eight musical shorts were Caro Nome, An Evening on the Don, La Fiesta, His Pastimes, The Kreutzer Sonata, Mischa Elman, Overture "Tannhäuser" and Vesti La Giubba. ↑ Crafton (1997), pp. 76–87; Gomery (2005), pp. 38–40. ↑ Liebman (2003), p. 398. ↑ Schoenherr, Steven E. (March 24, 2002). "Dynamic Range". Recording Technology History. History Department at the University of San Diego. Archived from the original on September 5, 2006. Retrieved December 11, 2009. 1 2 Schoenherr, Steven E. (October 6, 1999). "Motion Picture Sound 1910–1929". Recording Technology History. History Department at the University of San Diego. Archived from the original on April 29, 2007. Retrieved December 11, 2009. ↑ The Bell "Rubber Line" Recorder. ↑ Crafton (1997), p. 70. ↑ Schoenherr, Steven E. (January 9, 2000). "Sound Recording Research at Bell Labs". Recording Technology History. History Department at the University of San Diego. Archived from the original on May 22, 2007. Retrieved December 7, 2009. ↑ Gomery (2005), pp. 42, 50. See also Motion Picture Sound 1910–1929, perhaps the best online source for details on these developments, though here it fails to note that Fox's original deal for the Western Electric technology involved a sublicensing arrangement. Archived April 29, 2007, at the Wayback Machine. ↑ Crafton (1997), pp. 129–30. ↑ Gomery (1985), p. 60; Crafton (1997), p. 131. ↑ Lasky (1989), pp. 21–22. ↑ Eyman (1997), pp. 149–50. ↑ Glancy (1995), p. 4 [online]. 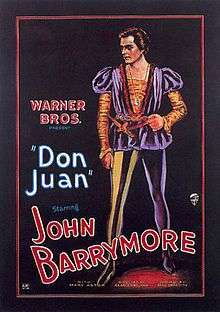 The previous highest-grossing Warner Bros. film was Don Juan, which Glancy notes earned $1.693 million, foreign and domestic. Historian Douglas Crafton (1997) seeks to downplay the "total domestic gross income" of The Jazz Singer, $1.97 million (p. 528), but that figure alone would have constituted a record for the studio. Crafton's claim that The Jazz Singer "was in a distinct second or third tier of attractions compared to the most popular films of the day and even other Vitaphone talkies" (p. 529) offers a skewed perspective. Although the movie was no match for the half-dozen biggest hits of the decade, the available evidence suggests that it was one of the three highest-earning films released in 1927 and that overall its performance was comparable to the other two, The King of Kings and Wings. It is undisputed that its total earnings were more than double those of the next four Vitaphone talkies; the first three of which, according to Glancy's analysis of in-house Warner Bros. figures, "earned just under $1,000,000 each", and the fourth, Lights of New York, a quarter-million more. ↑ Allen, Bob (Autumn 1997). "Why The Jazz Singer?". AMPS Newsletter. Association of Motion Picture Sound. Retrieved December 12, 2009. 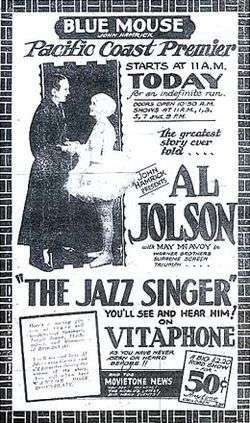 Note that Allen, like many, exaggerates The Jazz Singer's commercial success; it was a big hit, but not "one of the big box office hits of all time". ↑ Glancy (1995), pp. 4–5. Schatz (1998) says the production cost of Lights of New York totaled $75,000 (p. 64). Even if this number is accurate, the rate of return was still over 1,600%. ↑ Eames (1985), p. 36. ↑ Crafton (1997) describes the term's derivation: "The skeptical press disparagingly referred to these [retrofitted films] as 'goat glands' ... from outrageous cures for impotency practiced in the 1920s, including restorative elixers, tonics, and surgical procedures. It implied that producers were trying to put some new life into their old films" (pp. 168–69). ↑ Block and Wilson (2010), p. 56. ↑ Crafton (1997), pp. 169–71, 253–54. ↑ In 1931, two Hollywood studios would release special projects without spoken dialogue (now customarily classified as "silents"): Charles Chaplin's City Lights (United Artists) and F. W. Murnau and Robert Flaherty's Tabu (Paramount). The last totally silent feature produced in the United States for general distribution was The Poor Millionaire, released by Biltmore Pictures in April 1930. Four other silent features, all low-budget Westerns, were also released in early 1930 (Robertson , p. 173). ↑ "How the Pictures Learned to Talk: The Emergence of German Sound Film". Weimar Cinema. filmportal.de. Retrieved December 7, 2009. ↑ Gomery (1980), pp. 28–30. ↑ See, e.g., Crisp (1997), pp. 103–4. ↑ Low (1997a), pp. 178, 203–5; Low (1997b), p. 183; Crafton (1997), pp. 432; "Der Rote Kreis". Deutsches Filminstitut. Retrieved December 8, 2009. Note also that IMDb.com incorrectly refers to Der Rote Kreis/The Crimson Circle as a British International Pictures (BIP) coproduction (it also spells Zelnik's first name "Frederic"). The authentic BIP production Kitty is sometimes included among the candidates for "first British talkie." In fact, the film was produced and premiered as a silent for its original 1928 release. The stars later came to New York to record dialogue, with which the film was rereleased in June 1929, after much better credentialed candidates. See sources cited above. ↑ Spoto (1984), pp. 131–32, 136. ↑ Jelavich (2006), pp. 215–16; Crafton (1997), p. 595, n. 59. ↑ Crisp (1997), p. 103; "Epinay ville du cinéma". Epinay-sur-Seine.fr. Retrieved December 8, 2009. Erickson, Hal. "Le Collier de la reine (1929)". Allmovie. NYTimes.com. Retrieved December 8, 2009. Chiffaut-Moliard, Philippe (2005). "Le cinéma français en 1930". Chronologie du cinéma français (1930–1939). Cine-studies. Retrieved December 8, 2009. In his 2002 book Genre, Myth, and Convention in the French Cinema, 1929–1939 (Bloomington: Indiana University Press), Crisp says that Le Collier de la reine was "'merely' sonorized, not dialogued" (p. 381), but all other available detailed descriptions (including his own from 1997) mention a dialogue sequence. Note also that Crisp gives October 31 as the debut date of Les Trois masques and Cine-studies gives its release ("sortie") date as November 2. Note finally, where Crisp defines in Genre, Myth, and Convention a "feature" as being a minimum of sixty minutes long, this article follows the equally common, and Wikipedia-prevalent, standard of forty minutes or longer. ↑ Chapman (2003), p. 82; Fisher, David (July 22, 2009). "Chronomedia: 1929". Chronomedia. Terra Media. Retrieved December 8, 2009. ↑ Carné (1932), p. 105. ↑ Stojanova (2006), p. 97. According to Il Cinema Ritrovato, the program for XXI Mostra Internazionale del Cinema Libero (Bologna; November 22–29, 1992), the film was shot in Paris. According to the IMDb entry on the film, it was a Czech-German coproduction. The two claims are not necessarily contradictory. 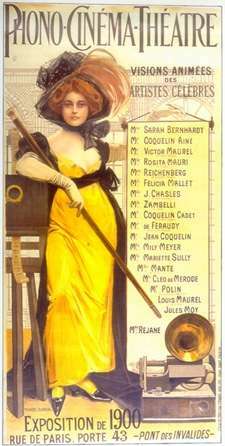 According to the Czech-Slovak Film Database, it was shot as a silent film in Germany; soundtracks for Czech, German, and French versions were then recorded at the Gaumont studio in the Paris suburb of Joinville. ↑ See Robertson (2001), pp. 10–14. Robertson claims Switzerland produced its first talkie in 1930, but it has not been possible to independently confirm this. The first talkies from Finland, Hungary, Norway, Portugal, and Turkey appeared in 1931, the first talkies from Ireland (English-language) and Spain and the first in Slovak in 1932, the first Dutch talkie in 1933, and the first Bulgarian talkie in 1934. In the Americas, the first Canadian talkie came out in 1929—North of '49 was a remake of the previous year's silent His Destiny. 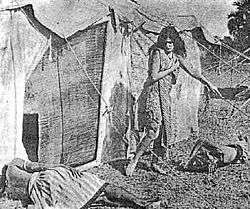 The first Brazilian talkie, Acabaram-se os otários (The End of the Simpletons), also appeared in 1929. That year, as well, the first Yiddish talkies were produced in New York: East Side Sadie (originally a silent), followed by Ad Mosay (The Eternal Prayer) (Crafton , p. 414). Sources differ on whether Más fuerte que el deber, the first Mexican (and Spanish-language) talkie, came out in 1930 or 1931. The first Argentine talkie appeared in 1931 and the first Chilean talkie in 1934. Robertson asserts that the first Cuban feature talkie was a 1930 production called El Caballero de Max; every other published source surveyed cites La Serpiente roja (1937). Nineteen-thirty-one saw the first talkie produced on the African continent: South Africa's Mocdetjie, in Afrikaans. Egypt's Arabic Onchoudet el Fouad (1932) and Morocco's French-language Itto (1934) followed. ↑ Rollberg (2008), pp. xxvii, 9, 174, 585, 669–70, 679, 733. 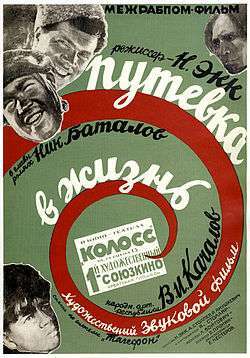 Several sources name Zemlya zhazhdet (The Earth Is Thirsty), directed by Yuli Raizman, as the first Soviet sound feature. Originally produced and premiered as a silent in 1930, it was rereleased with a non-talking, music-and-effects soundtrack the following year (Rollberg , p. 562). ↑ Morton (2006), p. 76. ↑ Rollberg (2008), pp. xxvii, 210–11, 450, 665–66. ↑ Crisp (1997), pp. 101–2. ↑ Nolletti (2005), p. 18; Richie (2005), pp. 48–49. ↑ Burch (1979), pp. 145–46. Note that Burch misdates Madamu to nyobo as 1932 (p. 146; see above for sources for correct 1931 date). He also incorrectly claims that Mikio Naruse made no sound films before 1936 (p. 146; see below for Naruse's 1935 sound films). 1 2 Freiberg (1987), p. 76. ↑ Naruse's first talking picture, Otome-gokoro sannin shimai (Three Sisters with Maiden Hearts), as well as his widely acclaimed Tsuma yo bara no yo ni (Wife! Be Like a Rose! ), also a talkie, were both produced and released in 1935. Wife! Be Like a Rose! was the first Japanese feature film to receive American commercial distribution. See Russell (2008), pp. 4, 89, 91–94; Richie (2005), pp. 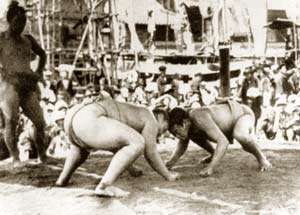 60–63; "Mikio Naruse—A Modern Classic". Midnight Eye. February 11, 2007. Retrieved December 12, 2009. Jacoby, Alexander (April 2003). "Mikio Naruse". Senses of Cinema. Retrieved December 12, 2009. 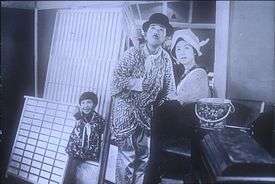 Ozu's first talking picture, which came out the following year, was Hitori musuko (The Only Son). See Richie (1977), pp. 222–24; Leahy, James (June 2004). "The Only Son (Hitori Musuko)". Senses of Cinema. Retrieved December 12, 2009. ↑ Quoted in Sharp, Jasper (March 7, 2002). "A Page of Madness (1927)". Midnight Eye. Retrieved December 7, 2009. ↑ See Freiberg (2000), "The Film Industry." ↑ Reade (1981), pp. 79–80. ↑ Ranade (2006), p. 106. ↑ Pradeep (2006); Narasimham (2006); Rajadhyaksha and Willemen (2002), p. 254. 1 2 Anandan, "Kalaimaamani". "Tamil Cinema History—The Early Days: 1916–1936". INDOlink Tamil Cinema. Retrieved December 8, 2009. ↑ Chapman (2003), p. 328; Rajadhyaksha and Willemen (2002), p. 255; Chatterji (1999), "The First Sound Films"; Bhuyan (2006), "Alam Ara: Platinum Jubilee of Sound in Indian Cinema." In March 1934 came the release of the first Kannada talking picture, Sathi Sulochana (Guy ); Bhakta Dhruva (aka Dhruva Kumar) was released soon after, though it was actually completed first (Rajadhyaksha and Willemen , pp. 258, 260). A few websites refer to the 1932 version of Heer Ranjha as the first Punjabi talkie; the most reliable sources all agree, however, that it is performed in Hindustani. The first Punjabi-language film is Pind di Kuri (aka Sheila; 1935). The first Assamese-language film, Joymati, also came out in 1935. Many websites echo each other in dating the first Oriya talkie, Sita Bibaha, as 1934, but the most authoritative source to definitively date it—Chapman (2003)—gives 1936 (p. 328). The Rajadhyaksha and Willemen (2002) entry gives "1934?" (p. 260). ↑ Lai (2000), "The Cantonese Arena." ↑ Ris (2004), pp. 35–36; Maliangkay, Roald H (March 2005). "Classifying Performances: The Art of Korean Film Narrators". Image & Narrative. Archived from the original on May 28, 2008. Retrieved December 9, 2009. ↑ Lee (2000), pp. 72–74; "What Is Korea's First Sound Film ("Talkie")?". The Truth of Korean Movies. Korean Film Archive. Retrieved December 9, 2009. ↑ Millard (2005), p. 189. 1 2 Allen, Bob (Autumn 1995). "Let's Hear It For Sound". AMPS Newsletter. Association of Motion Picture Sound. Retrieved December 13, 2009. ↑ Bordwell (1985), pp. 300–1, 302. ↑ Bordwell and Thompson (1995), p. 124; Bordwell (1985), pp. 301, 302. Note that Bordwell's assertion in the earlier text, "Until the late 1930s, the post-dubbing of voices gave poor fidelity, so most dialogue was recorded direct" (p. 302), refers to a 1932 source. His later (coauthored) description, which refers to the viability of looping in 1935, appears to replace the earlier one, as it should: in fact, then and now, most movie dialogue is recorded direct. ↑ Crafton (1997), pp. 147–48. ↑ See Bernds (1999), part 1. ↑ See Crafton (1997), pp. 142–45. ↑ Thomson (1998), p. 732. ↑ Crafton (1997), pp. 480, 498, 501–9; Thomson (1998), pp. 732–33, 285–87; Wlaschin (1979), pp. 34, 22, 20. ↑ Crafton (1997), p. 480; Wlaschin (1979), p. 26. ↑ Thomson (1998), pp. 288–89, 526–27, 728–29, 229, 585–86: Wlaschin (1979), pp. 20–21, 28–29, 33–34, 18–19, 32–33. ↑ Thomson (1998), pp. 80–81; Crafton (1997), pp. 498–501, 508–9. ↑ See Dardis (1980), pp. 190–91, for an analysis of the profitability of Keaton's early sound films. ↑ Thomson (1998), pp. 376–77, 463–64, 487–89; Wlaschin (1979), pp. 57, 103, 118, 121–22. ↑ Thomson (1998), pp. 69, 103–5, 487–89; Wlaschin (1979), pp. 50–51, 56–57. ↑ Thomson (1998), pp. 45–46, 90, 167, 689–90, 425–26, 122–24; Wlaschin (1979), pp. 45–46, 54, 67, 148, 113, 16–17. ↑ Thomson (1998), pp. 281, 154–56; Wlaschin (1979), pp. 87, 65–66. ↑ Thomson (1998), pp. 274–76; Wlaschin (1979), p. 84. ↑ Friedrich, Otto (1997). City of Nets: A Portrait of Hollywood in 1940s (reprint ed.). Berkeley and Los Angeles: University of California Press. p. 9. ISBN 0520209494. ↑ "1920–1929". Our History. American Federation of Musicians. Retrieved December 9, 2009. "1927 – With the release of the first 'talkie,' The Jazz Singer, orchestras in movie theaters were displaced. The AFM had its first encounter with wholesale unemployment brought about by technology. Within three years, 22,000 theater jobs for musicians who accompanied silent movies were lost, while only a few hundred jobs for musicians performing on soundtracks were created by the new technology. 1928 – While continuing to protest the loss of jobs due to the use of 'canned music' with motion pictures, the AFM set minimum wage scales for Vitaphone, Movietone and phonograph record work. Because synchronizing music with pictures for the movies was particularly difficult, the AFM was able to set high prices for this work." ↑ Oderman (2000), p. 188. ↑ Gomery (1985), pp. 66–67. Gomery describes the difference in profits simply between 1928 and 1929, but it seems clear from the figures cited that he is referring to the fiscal years that ended September 30. The fiscal year roughly paralleled (but was still almost a month off from) the traditional Hollywood programming year—the prime exhibition season began the first week of September with Labor Day and ran through Memorial Day at the end of May; this was followed by a fourteen-week "open season", when films with minimal expectations were released and many theaters shut down for the hot summer months. See Crafton (1997), pp. 183, 268. ↑ Lasky (1989), p. 51. ↑ Finler (2003), p. 376. ↑ Segrave (1997) gives the figures as 282 million feet in 1929 compared to 222 million feet the year before (p. 79). Crafton (1997) reports the new mark in this peculiar way: "Exports in 1929 set a new record: 282,215,480 feet (against the old record of 9,000,000 feet (2,700,000 m) in 1919)" (p. 418). But in 1913, for instance, the U.S. exported 32 million feet of exposed film (Segrave , p. 65). Note also that Crafton says of the 1929 exports, "Of course, most of this footage was silent", though he provides no figures (p. 418). In contrast, if not necessarily contradiction, Segrave points to the following: "At the very end of 1929 the New York Times reported that most U.S. talkies went abroad as originally created for domestic screening" (p. 77). ↑ Rajadhyaksha and Willemen (2002), p. 254; Joshi (2003), p. 14. ↑ Rajadhyaksha and Willemen (2002), pp. 30, 32. ↑ Robertson (2001), pp. 16–17; "Analysis of the UIS International Survey on Feature Film Statistics" (PDF). UNESCO Institute for Statistics. May 5, 2009. Retrieved December 13, 2009. ↑ Quoted in Agate (1972), p. 82. ↑ Quoted in Chapman (2003), p. 93. ↑ Quoted in Crafton (1997), p. 166. 1 2 Kaes (2009), p. 212. ↑ See, e.g., Crafton (1997), pp. 448–49; Brownlow (1968), p. 577. ↑ Time Out Film Guide (2000), pp. x–xi. ↑ Kemp (1987), pp. 1045–46. ↑ Arnold, Jeremy. 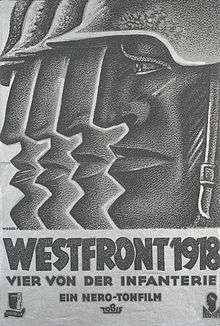 "Westfront 1918". Turner Classic Movies. Retrieved December 13, 2009. ↑ Rosen (1987), pp. 74–76. ↑ M, for instance, is the earliest sound film to appear in the 2001 Village Voice: 100 Best Films of the 20th Century poll and the 2002 Sight and Sound Top Ten (among the 60 films receiving five or more votes). See also, e.g., Ebert (2002), pp. 274–78. ↑ Ebert (2002), p. 277. ↑ Hamilton (2004), p. 140. ↑ Bazin (1967), p. 155. ↑ There is disagreement on the running time of the film. The Deutsches Filminstitut's webpage on the film gives 48 minutes; the 35 Millimeter website's entry gives 40 minutes. According to filmportal.de, it is "some 40 minutes". ↑ Quoted in Dibbets (1999), pp. 85–86. ↑ Quoted in Dibbets (1999), p. 85. ↑ See Spoto (1984), pp. 132–33; Truffaut (1984), pp. 63–65. ↑ Milne (1980), p. 659. See also Crafton (1997), pp. 334–38. ↑ Quoted in Bordwell (1985), p. 298. See also Bordwell and Thompson (1995), p. 125.